If he judged it as permitted (and it is commonly known among scholars and lay people that it is forbidden and he is not like a new Muslim who has never heard of it being forbidden). If he did it in scorn to the one who forbade it (e. Aļļaah). If he did it for the purpose of rebelling against Aļļaah. In these above cases he has committed kufr (i.e. become a non-Muslim – and must come back to Islam by uttering the creedal statement with the intention to clear himself of that kufr and come back to Islam). then he is called a sinful believer. The judgment for this person is that if he repents (meeting all of the conditions of complete repentance), then he will be forgiven. However, if he dies before repenting, then it depends on what Aļļaah has willed for him: Aļļaah may forgive him by His grace and mercy, or accept the intercession of a prophet or waliyy among His pious worshippers, or He may torture him for his crime before entering him into Paradise. The Creator is beginningless and is attributed with attributes that are beginningless. The attributes of the Creator are not Him Himself [i.e. Aļļaah is not merely an attribute, e.g. we do not believe that Aļļaah is power, but that He is attributed with power], nor other than Him [i.e. His attributes are not divisible or parts]. Events do not occur in Him, and [hence,] He is not attributed with movement or changing position [or stillness, since He is not a body] or ignorance, or lying, or imperfection. Whatever He has willed will be, and whatever He has not willed will not be. Nothing is incumbent upon Him. Everything created [i.e. everything that has a beginning, including bodies and what occurs in them of movement, color, shape, ideas, intentions, etc.] is according to His predestination, specification, and will. [All acts of creation are created by Aļļaah,] however, acts of creation that are said to be ugly due to their sinfulness [by Aļļaah’s legal prescription] are not said to be liked, ordered or accepted by Him. [Note: Aļļaah is not attributed with emotions, since emotions imply needs as well as change in state of being, and Aļļaah does not change. Hence, words like mahabbah (literal translation: love) are ascribed to Aļļaah in Arabic with reference to certain acts of creation to mean that these acts are rewardable in the Hereafter]. The signs of the day of judgment are true, such as the coming of Dajjaal, as well as Ya’juuj and Ma’juuj; the descent of Jesus, the sun rising in the west, the coming of the beast [that will tell everyone whether he is a Muslim or a Blasphemer]. The first of the prophets is Adam and the very last is Muhammad. The first Khaliifah was Abu Bakr followed by Umar, Uthman and Ali, may Aļļaah please them. The status of these four is in the same order, except for some [strange and unusual] hesitation regarding the order between Uthman and Ali. 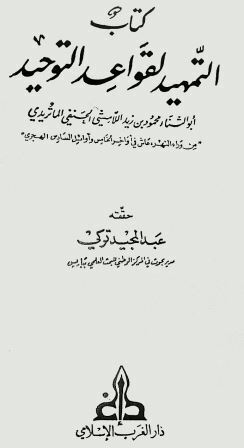 The famous scholars of Sunni beliefs in the areas of Khurasan, Iraq, Levant, and most areas in general, are the Ashˆaris, the companions of Abu Al-Hasan Ali son of Ismaaˆiil son of Ishaaq son of Saalim son of Ismaaˆiil son of Abdullaah son of Bilaal son of Abu Burdah son of Abu Muusaa Al-AshˆAriyy, the companion of the Prophet. He was the first [student of Al-Jubbaa’iyy] to disagree with Abu Ali Al-Jubbaa’iyy [the Muˆtazilite] and reject his school of thought in order to embrace the way of the Sunnah, i.e. the way of the Prophet (may Aļļaah raise his rank further) and the jamaaˆah, i.e. the way of the companions. [The famous scholars of Sunni beliefs] in the lands behind the river [i.e. Amu Darya] are the companions of Al-Maaturiidiyy, who was the student of Abu Nasr Al-ˆiiaađ, the student of Abu Bakr Al-Jurjaaniyy, the companion of Abu Sulaymaan Al-Jurjaaniyy, the student of Muĥammad ibn Al-Hasan Al-Shaybaaniyy, may Aļļaah have mercy upon him. Maaturiid is a village in Samarkand [in today’s Uzbekistan]. Some disagreement has appeared among these two groups with regard to belief and methodology issues like that of takwiin, exemption in belief [i.e. does the one who says “I am a believer – in shaa’ Aļļaah” imply doubt or not? All agree that doubt is kufr], the belief status of the imitator [but all agree that the imitator that thinks he might leave Islam if the one he imitates leaves is a kaafir, because ones commitment to the belief must be unconditional), and some other issues. The great authenticators from the two groups of scholars do not accuse one another of bad innovation or heresy. This is unlike bigots that may even base heresy accusation on disagreements regarding detailed legal issues like animals slaughtered without mentioning the name of Aļļaah when it was not due to forgetting, or the wuđuu’ not breaking due to najis coming out of other than the private organs, or the validity of marriage without a waliyy, or prayer without reciting Fatihah. do not have a legal Islamic proof as a basis. 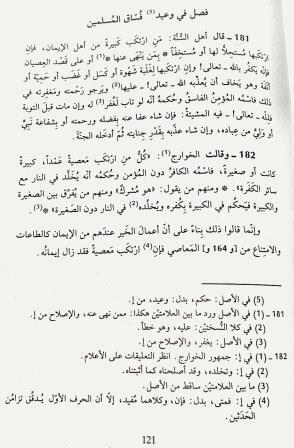 Some ignorant people claim that all things that were not present at the time of the companions are bad innovations, even if there is no legal Islamic proof for it being bad. They base this on the saying of the Prophet (may Aļļaah raise his rank even further) [literal translation:] “Beware of new matters…” They do not know that what is meant by this is making a matter part of the religion when it is not a part of it. May Aļļaah protect us from following deviant whims and make us firm in following the guidance of the Prophet and His followers. You are currently browsing the archives for the Kalam Science category.